The Sensepoint XCD range provides comprehensive monitoring of flammable, toxic, and oxygen gas hazards in potentially explosive atmospheres, both indoors and outdoors. Make your chemical plant run more safely, efficiently, and profitably with this gas transmitter, which is easy to install, use, and maintain. 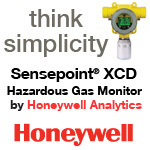 It's from Honeywell Analytics, experts in gas detection. Visit our web site for more information about this product.